How Often Do You Water English Ivy As an Indoor Plant? The English ivy will be a welcome addition to your home if you'd like a low-maintenance plant. Once you have found the right location for your ivy, it will grow effortlessly with good light and water. The ivy is a climber and given the right location is seemingly unstoppable for the length it can grow. Ivy is also well suited for trailing across a mantel or inside a hanging basket. Ivy has roots on the stems which help it to climb. Check the soil for moisture content before adding more water. Use your finger to test the top inch of soil; if the top inch is dry, the ivy is in need of water. Add water by pouring onto the top soil and use water that is lukewarm or water that is at least room temperature. 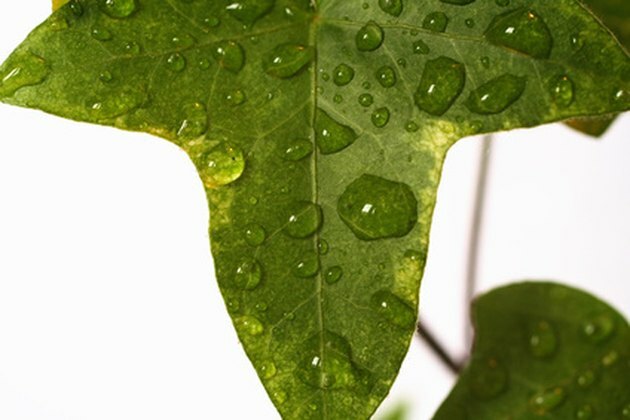 Misting the plant daily will also help keep spider mites away, an enemy of the English ivy. The ivy prefers a room temperature of 50 to 70 F; warmer room temperatures may require more frequent watering to keep the soil moist, but do not let the soil become soggy. Place the plant where it will receive bright, but not direct sunlight. The ivy also grows well under fluorescent lighting. Variegated leaves that start to change color to mostly green are an indication that the plant isn't getting enough light. You will need to provide more sun for the ivy leaves to remain variegated, and also remove stems with mostly green leaves. Leaves will grow toward the sun, and the pot needs to be rotated occasionally to prevent a lop-sided look. Fertilize once a month starting in the spring and into fall. Use a liquid fertilizer that has a high-nitrogen content. The fertilizer container will be labeled as high-nitrogen. General, all-purpose potting soil works well for English ivy. The soil should retain water and also drain well. Homemade soil can also be made from equal parts of garden soil, coarse sand, moist peat and a small amount of lime. Place a bottom layer of small rock or gravel in the bottom of a pot with a hole. Partially fill the pot with soil and add the ivy. Fill the area around the plant with more soil and lightly compact the soil. The soil will compact itself more after the first watering, and more soil will need to be added. Avoid setting the ivy in a draft, and keep it away from heating vents which will dry out the leaves. The leaves are poisonous if eaten and can cause skin irritation. Wear gloves when pruning or potting to protect your skin. Why Would an Ivy Plant's Leaves Start to Turn Yellow?